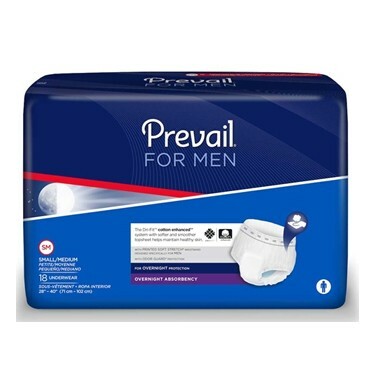 Prevail for Men Protective Underwear is specifically designed for men who need moderate to heavy or extended use leakage protection, it has the look and feel of regular underwear. Cotton enhanced™ surface helps keep skin healthy by reducing friction. QUICK WICK with MaxSoft and a cotton enhanced surface quickly wicks wetness away from the skin. Cloth-like outer fabric that is breathable, soft and comfortable. Odor Guard technology helps prevent odors before they develop. Breathable Zones are ventilated side areas that allow the skin to breathe.